The fabricated internet-based news story that solar energy is more damaging to the environment than power generated from fossil fuels is getting traction on social media, and the misinformation campaign it represents is our story of the year. 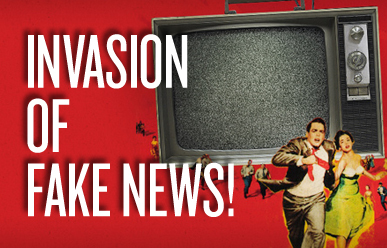 Web-based disinformation peddling is a growing problem that serves to reinforce people’s erroneous beliefs. And more and more fake news sites are being set up to actively exploit the segment of the population that are misinformed. The idea that solar energy is more environmentally harmful than fossil fuel is not only false, but its propaganda message is meant to slow a transition to a cleaner future. The bottom line is that the facts do not support the claim that solar energy contributes more to climate change than fossil fuels. According to the 2011 report on renewable energy sources and climate change mitigation, the International Panel on Climate Change calculated the life-cycle global warming emissions associated with renewable energy—including manufacturing, installation, operation and maintenance, and dismantling and decommissioning—as minimal . It is a narrative that is repeated by other research and data that has been collected and reported in peer studies over the past decade. The Union of Concerned Scientists compared the carbon dioxide emissions equivalent per kilowatt-hour for coal and renewable energy resources. It should be no surprise that coal is the most polluting electricity generating resource and renewables the least. Coal emits more than 20 times as much carbon dioxide equivalent per kilowatt-hour compared to the life-cycle carbon emissions for solar PV. The comparison between coal and wind is even greater. Coal emits nearly 80 times as much carbon dioxide for each kilowatt-hour of electricity generated . Forget for a moment the damage of fossil fuels to the environment: generating electricity from renewable energy rather than fossil fuels offers significant public health benefits too. From reduced premature mortality to lost workdays associated with breathing illnesses, the economic impact of fossil fuels on overall healthcare costs has been estimated at between $361.7 and $886.5 billion . In addition, a study by the U.S. Department of Energy's National Renewable Energy Laboratory explored the feasibility and environmental impacts associated with generating 80 percent of the country’s electricity from renewable sources by 2050 and found that global warming emissions from electricity production could be reduced by more than 80 percent . There is also a strong economic argument to be made for a clean energy future. In 2009, the Union of Concerned Scientists conducted an analysis of the economic benefits of a 25 percent renewable energy standard by 2025; it found that such a policy would create more than three times as many jobs as producing an equivalent amount of electricity from fossil fuels, resulting in a benefit of 202,000 new jobs in 2025 . The environmental and economic benefits of solar are great. So why are we allowing a truly great narrative to be hijacked by misinformation that is intended to undermine the very foundation upon which the renewable energy industry was built? The misinformation, while easily refuted, still inflicts damage. For every person that will see and read a correction, ten won’t. The lie that Winston Churchill spoke of will have considerably more impact on perception of an issue than the facts that are marshalled to refute the original lie. Question: The Fake News term has been appropriated to label anything that someone disagrees with. How can this trend be reversed? Intergovernmental Panel on Climate Change (IPCC). 2011. IPCC Special Report on Renewable Energy Sources and Climate Change Mitigation. Union of Concerned Scientists (UCS). 2009. Machol, Rizk. 2013. Economic value of U.S. fossil fuel electricity health impacts. Environment International 52 75–80. National Renewable Energy Laboratory (NREL). 2012. Renewable Electricity Futures Study. Volume 1, pg. 210. Environmental Protection Agency. 2010. Assessing the Multiple Benefits of Clean Energy: A Resource for States. Chapter 5.